Yes, that is snow on the grass! Remove dough from mixing bowl and place in airtight container for storage overnight. Prior to putting on the lid to the dough knead it all together so it makes one big mound. Doing this locks in the flavor and makes for the best tasting cookies. Tightly place lid on and store dough in the fridge overnight. 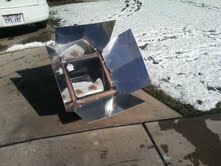 The next day when you are ready to have some delicious cookies place your Sun Oven out to preheat. While you wait for it to reach 350 degrees sprinkle a tablespoon of flour and on counter and roll the dough to 1/4 inch thick. Bake for 8 min. in the Sun Oven or if cooking inside 9 min. Once cooked, let the cookies set on pan for 1 min. before removing onto a cooling rack. Once you have finished frosting you are done! 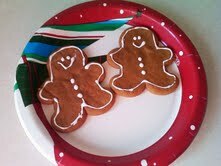 Now thoughtfully consider who you love most and who you would be willing to share these oh so delicious treats! May you have successful solar cooking and find much enjoyment in these scrumptious morsels as much as our family has this Christmas season!! 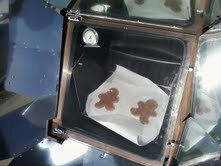 Just what our site visitors needed at this time of the year...Solar Baked Ginger Bread Cookies! 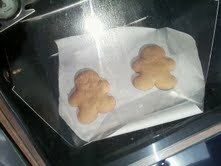 I too have had great success doing gingerbread cookies in my solar cookers. ...I need to do this before Christmas gets here.